The dentist office phones, again. They say it is time for me to schedule in my 6 months cleaning and they just happen to have a cancellation (yeah right they do). Would I like to come in? When did I give my permission for the dentist office to take over the responsibility of my oral health? When I want to go to the dentist, I will phone them and make an appointment. In todays multi-media, chained to the grid world, the lines of respect for peoples privacy and autonomy are becoming blurred. Signing up for a website or giving out my email or telephone number does not give permission for others to exploit that information. Selling my private information, spam, junk mail, robo-calling, tracking my buying habits are also forms of marketing that I did not give my permission to receive. Government’s have passed privacy laws but the problem it so large it is near impossible to enforce. 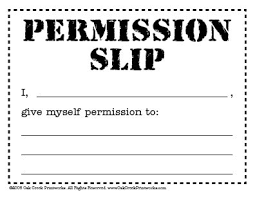 There is another form of getting permission that effects a lot of people as well and that is the need to get permission from others to make decisions for ourselves. We have become so use to having the decisions for our lives taken out of our hands, that some of us have lost the ability to do it for ourselves any more. In order to live in a safe society, laws are constantly being created that subversively remove our right to choose. Just think about how life has changed since 9/11 and you will understand how our personal freedoms have been eroded in the name of safety. Social media and exposure to instant news has boxed us in to a fear mindset. Don’t be different, follow the crowd for fear of being shamed publicly. Even if you are doing something worthy, there is bound to be someone out there that will criticize. Who gave them permission to rain on your parade? Even well meaning, kind hearted individuals whose only desire is to bring encouragement and light to our lives, gnaw at our personal sovereignty. We hold these folks up as the high standard we wish to achieve while we internally chastise ourselves for not being able to level up. Who gave them permission to make us feel small? Who indeed. We did. We gave them permission. This is one of the insidious cancers of being connected all the to time to the information highway. The more we connect the more we lose our sense of self. Allowing others opinions and views to matter more than our own. And it’s addictive. Change your profile picture and watch how many “likes” you get. We crave acceptance, we want to be liked. Being noticed and getting approval is really asking for permission from other people to exist. Permission is a synonym for acceptance. Look it up. Here’s an example I just experienced. I decided to apply for a online course for a non-traditional area of study. I had the application almost filled out when I accidentally deleted it and ran out of time to do it again. So I decided to leave it until later. As the night progressed, good old doubt began to fill my head. What will my friends and family think when they find out I am pursuing this line of study? Then guilt pushed it’s way in. Who do I think I am to want to try something different? Luckily, I’ve been down this road more times than I care to admit and saw the sign post up ahead. CAUTION! Get permission from others first before you proceed. Nope, not any more. I’m the one creating this life. The only permission I need to live my life the way I want, is from myself. It does not matter what others think about the topics of study I’m interested. I am interested, that is all that should matter. The only caution here is that by giving myself total control of my destiny, I also have to take complete responsibility for both my successes and failures. Not to mention ignoring any negative opinions from those who, in the past, I would have sought permission from. Piece of cake. Right? Don’t take my word for it. You don’t need my permission to believe it. But if you are not living up to your potential, and it’s causing you unhappiness, perhaps figuring out who’s permission you think you need will give you a clue as to why you are not in control of your own destiny. If you like this post. Please share it. Others may like to. Loved this!!!! I think everybody should read it. Thank you as always. I appreciate your support. Great post! I totally agree with what you said. Your point at the end is really valid and in my opinion the reason why so many people don’t want to give themselves permission, because it means they have to accept responsibility for the outcome. Thanks Mary. I’m glad you enjoyed it. Hey you. it’s not a new line of study per say. It is a professional Intuitive course with Slade Roberson. His website is Shift your Spirit. But is a non traditional course. I have lost your email address. Please forward so we can update each other about our lives. love this post, it’s so true about everything! Thank you so much for the vote of confidence. I hope you continue to enjoy my perspectives on life.